Just wanted to share what i threw together last night. After trying to find something similar, I just decided I'd have to make it up as i went. It turned out pretty good. I love the look so far (although the nose is far from done). I wanted to build something similar to the Bixler, so that's where I got most the inspiration. I know, why rebuild an already inexpencive plane. But I had a box a foam and an afternoon, so there it is. Let me what you think. If there is interest, I will put together some plans for it. It looks like it will be a nice, stable flyer. What are you planning on powering it with? Any idea what your all up weight will be? Looks cool, try a low Kv motor with a big prop. Maybe a triple blade? Looks really cool but the motor mount looks a bit wobly! I've got 900kv turnigy motor that I'll be swinging an 8" prop with. That's about all the room I have without going with a 3 blade (which I may have to try). Not sure on weight yet. 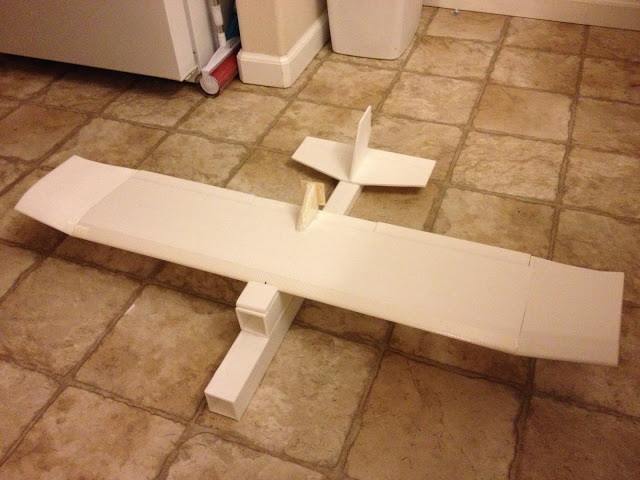 It's a 40" wingspan and 8" wide, so I should have plenty of wing there. 9gr all around, a 20amp and 3s 1800 should round it out. I'll get it on the scale tonight to see what it weighs. Flying weight without FPV gear is about 28oz. FPV gear will add about 5-6 oz at the most. Total wing area is just over 300 sq/in. Almost have it ready to put in the air. I'll let ya know how it does.